A very wealthy business lady that is fascinated by the macabre and occult. At Poe’s Masquerade: Ophelia is very easily identified. Mainly due to her wardrobe primarily consisting of high-class dresses and finery; all in black. Bedeviled and Taken: Ophelia is rumored to be a wraith ever since she was widowed in an attack that took her husband and almost fatally injured her. Although she’s not a wraith, sometimes it is difficult for her to breathe if it’s too hot outside due to a lung injury. Best Friend, Worst Enemy: Ophelia is quick to snap at people she disapproves of. Often in a verbally abusive manner and sometimes she just doesn’t know how to keep her mouth shut — even when guns are drawn. Outside of that, she is normally calm and collected. Grave Mentality: As a result of the attack, the rumors, and her own low self-worth, something broke in Ophelia’s head. Ophelia suffers from Cotard’s Syndrome and is fully convinced that she is a wraith forced to walk the grounds of creation for eternity as consequence for failing to save her husband. She even keeps a phylactery in the form of her old wedding ring and veil locked in one of her vaults. The Talk About Town: As one of the most monetarily powerful people in Los Ares, as well as the most delusional one, most people know enough about Ophelia to at least recognize her. Ace in the Hole: She might not be the fastest draw or the sharpest shooter and her gun might be mostly for show, but when she eventually hits the mark, she hits the mark. The Devil’s Lair: Ophelia can always beat a hasty retreat so long as she’s in one of her businesses. From the Pit I Rule: Ophelia has fast, nimble, and devious hands. She can easily hide small objects on her person and cheat at any game; especially card games. How Dare You: Years of running a casino for her husband and working as a pit boss made Ophelia especially perceptive. Ophelia can tell when she’s being cheated on agreed terms or a game. Lady of the Meadow: With the rumors of Ophelia being an onryō or wraith and showing her true colors under a full moon and in an open field, she can scare off or terrify the weak willed by presence alone and the more courageous ones only under those conditions. Athame: A revolver commissioned from Juki’s store, made with ebony engraving, and chambering .357 magnum. A series of miscellaneous shops, low stakes gambling dens, and bars on both sides of town. Hallowed Grounds Funeral Home: A funeral home built not too far from the river into the Norton side of town. Accommodates all faiths and forms of funeral traditions for both Higashi and Norton, and it even features a crematorium. Silver Gates Casino: A casino built on the Norton side of town. Built with a similar layout to the Lunar Dawn Casino, but with an additional floor for Ophelia’s penthouse. Way too many dresses, all in the same color too. Born into a relatively upper-class family, Ophelia first found a job working in casinos as a dealer until she worked her way up to being a pit boss. From there, her life took a turn for mixing business with pleasure when it came to her boss. After they got married, Ophelia thought her life couldn’t get any better. About a year ago, things were nice and peaceful in Los Ares for once. To celebrate both the period of peace and their marriage, the two of them went to Ophelia’s favorite field on the Higashi outskirts to watch the night sky together. The rest of their time there felt almost like a blur to Ophelia as they went from one moment of whispering romantic nothings to each other, and then to guns drawn between her husband and an unknown assailant as she clung to her husband’s side. A flash later and it might as well have been their last moments on earth together. For when she awoke, she laid on the ground next to her husband with a bleeding hole in her chest and two in his. Tired, bleeding, and finding it hard to breathe, she had no choice but to limp her way back to town alone. Now, Ophelia manages her husband’s businesses with cold numbers and even opened her own funeral home — the only business she directly administrates. 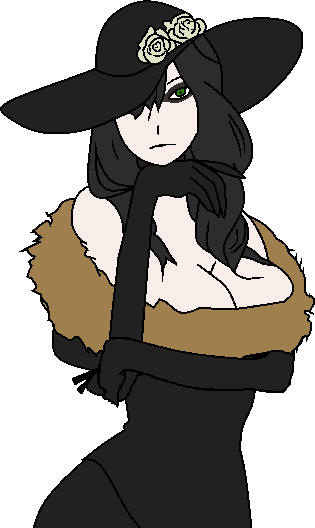 As a result of the circumstances from her last anniversary, Ophelia is fully convinced that she is an undead being known as a Wraith as punishment for not taking another bullet for her husband. Whether being a wraith is a rumor now spread amongst the populace, the reality of the situation, or simply a figment of her damaged psyche — no one can say for sure. She believes that in this town she was put to rest in an unmarked grave and she will never be able to leave it.